Everyone remembers his or her wedding day. But a couple who got married in Canada on Saturday has a special reason their day was memorable. You might say it was - stormy. According to the CTV television network, a professional photographer from Saskatchewan caught a giant funnel cloud in the background during an outdoor photo session. 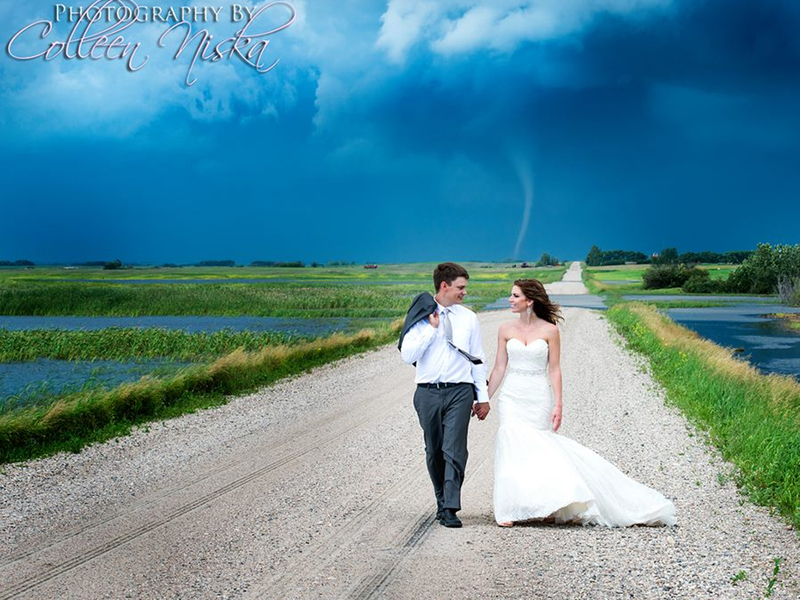 Colleen Niska was taking photos of a bride and groom on a rural road near Saskatoon when she noticed the twister in the distance, and kept snapping away, CTV says. Niska posted them Facebook, saying said she'd only "dreamed" of capturing such images. "Could NOT wait to post these!" she said. "Pretty sure this will only happen once in my lifetime!" By early Monday, Niska's album had some 13,000 shares on Facebook. Commenters were impressed with Niska's "amazing" photos. "Seriously, I'm betting you this is gonna blow up and get you very well known!" one person wrote. "An amazing message for their marriage... love through the storm. Love this!" said another. "They are wonderful pictures, but I am not sure I would be that calm with a tornado in the back ground," said another. According to CTV, Environment Canada confirmed that two tornadoes touched down near Outlook, Sask., which is about an hour's drive from where the photo shoot happened. The wind blew down a tent at the wedding reception, reports CTV, "but the rest of the outdoor party was said to be a success."